We offer our Mobile Banking products free to any CSB account holder. Choose any or all of our mobile products to make banking easier for you. 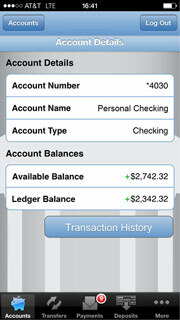 Online Banking is required to use our Mobile Banking products. To learn more about Online Banking and enroll click here. Get a customized application for your device that provides an intuitive and rich user experience consisting of easy-to-navigate screens and menus. Receive all the benefits of mobile browser banking, enhanced by your device’s unique features. To download, open Google Play or the App Store and search for TouchBanking . After you download the TouchBanking application, you will need to enter this App Code to activate it: citizens. Get full and extended mobile banking capabilities on your web-enabled device. Receive an optimal banking experience with a look and feel that is similar to PC-based online banking, in a site designed to fit neatly into your device’s screen. To use the Mobile Browser, you must be enrolled in Online Banking. To activate the Mobile Browser, login to Online Banking, select Options in the upper right, select Manage Devices in your Mobile Banking Profile, select the Mobile Browser option. 2019 © Citizens State Bank of Roseau. All Rights Reserved.